"I am beginning to learn that it is the sweet simple things of life which are the real ones after all." When I think about the simple things in life, I picture lazy days spent in the sunshine, and Summer picnics with my family. I can envision us relaxing, sipping on some refreshing lemonade, and enjoying one another's company. Spring is here, and it's the perfect time to start thinking about being outdoors, enjoying the sun and all that nature has to offer! "Little House on the Prairie" shows us how they value family time, whether it be during work or play. Meals were eaten together, and there was always time for fun & laughs! An old-fashioned picnic is the perfect time to gather with loved ones, enjoy delicious food, and engage in some outdoor play. I can picture the Ingalls family preparing for their afternoon picnic. Pa would start packing up their covered wagon, and the girls would help Ma fill the basket with fresh berries, pie, and lemonade. Ma would bring a soft, beautiful quilt to lay out in a field, and the girls would decide on what game they could all play together. 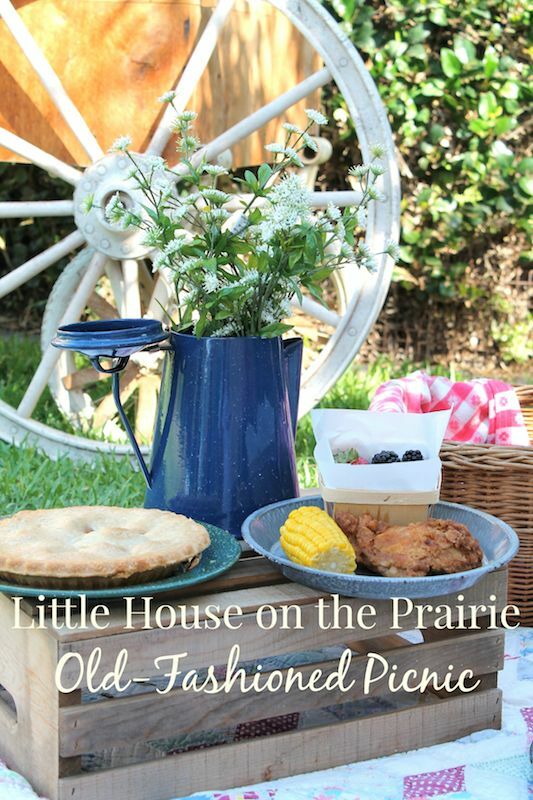 Before our Summer came to a close, I wanted to put together my own old-fashioned, Little House on the Prairie inspired, picnic. I gathered an old quilt, just like I pictured Ma would do. I prepared fried chicken, apple pie, bread, and packed up fresh strawberries, blueberries, and black berries. And I couldn't forget the lemonade! We have several fruit trees on our 1/3 acre lot, and a lemon tree is one of them. Need a lemonade recipe? You should try this traditional lemonade recipe. Delicious!